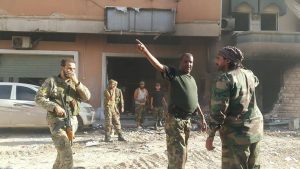 The Libyan National Army (LNA) today claimed complete control of Sidi Akribesh the final redoubt of Benghazi militants who had resisted attacks for more than four months. An airforce war plane flew above the district to salute the triumphant soldiers. But it has been a hard-won victory. After the LNA’s initial attacks were beaten back in August, Saiqa Special Forces, seen as the army’s most effective unit, were brought in to finish the siege, just as they were deployed in Ganfouda to bring an end to the resistance of militants in the 12 Apartments complex. In neither case did the operation prove as swift and effective as expected. It took two months before the Ganfouda militants were finally overcome. The initial plan in Sidi Akribesh was to starved out the defenders, whose snipers took a regular toll of the investing forces. A number of militants was killed and captured trying to escape the siege. Air strikes, which had been part of the earlier advance through Suq Al-Hout and Sabri were suspended, a military source said because the surrounded area was too small to be targeted accurately. Nevertheless, this week there was at least one further raid by a warplane. At the same time, Saiqa Special Forces commander Wanis Bukhamada took a direct hand in the operations. Tanks were brought up to blast away militant strong points. Three soldiers were killed and four wounded on Thursday along with two militants. It is unclear how many casualties there were in the final hours of the operation nor how many militants were killed or captured. There was a report in the summer that leading Ansar Al-Sharia figure Wissam Ben Hamid was trapped in the enclave.